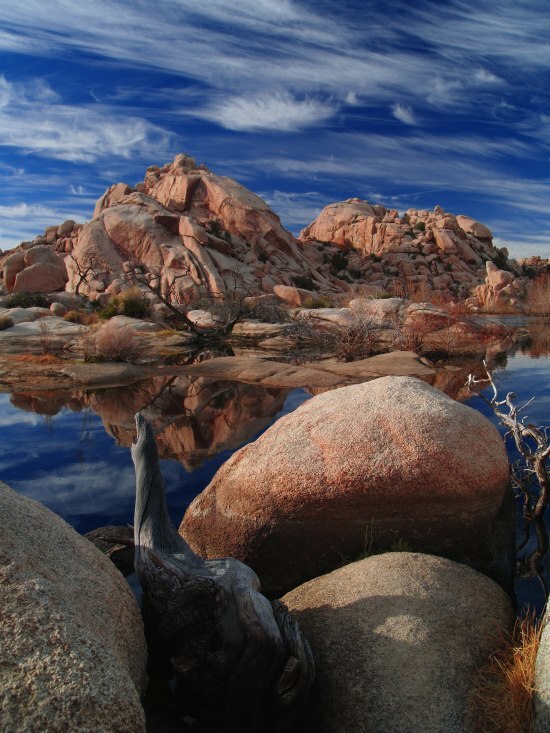 This was taken in Joshua Tree Nat'l Park at a place known as "Barker Dam". This dam and resulting small lake was created by early cattlemen in the turn of the century, in order to provide water for their cattle. It was late afternoon here, and the clouds and sky were becoming quite surreal, which made for great photography. A bit of red and blue was added, as well as more contrast. Amazing landscape, sharpness is superp. The details and textures of the scenery are beautiful. POV and depth are outstanding. Really a magical composition. great view!it is like a view of a beautiful planet from a sci-fi movie. nice colours and sharp details.clouds, the color of the sky, and the reflections on the lake are awesome in your compo.good POV and informative note. WOW - this is amazing. the pov is excellent and the reflection in the water A1. Fantastic photo Tim. What an interesting landscape and your photo really shows that. Beaautiful blues, whites and tinges of red. This is a very sharp photo. A fantastic composition with finely balanced objects, colors, contrasts and perspective. The sky looks truly surrealistic. Obviously, I look forward to seeing more of your work on the TN. That is a beautiful scenery in a surreal kind of way. Excellent composition and great colors. What a wonderful scene. The cloud, the rock and the reflection are all distinctive. And the color is also great. TFS. OH my! I can't say enough good things about this photo, it is truly stunning! It took my breath away. I love the colors, the reflections in the water, the sky, everything is set up perfectly! WOW says it all! AMAZING shot, Tim! The lighting is perfect, as is the composition. All of the elements are very strong. The polarizer adds a really dramatic touch to the sky that brings it all together, and I think without the polarizer it would be a very different photo where the rocks and reflection would dominate. Given all that, here is a very very minor suggestion... In an ideal world, the rocks in front would either not exist, match the ones in the background, or been in more shadow; but you did a great job with them. You might be able to help it by cropping them just below the white water mark on the main foreground rock. I have taken a crack at it, and it's posted as a workship. Great shot. The colours and sky is brilliant. Again your polarizer is worth every cent of it. How in the ..... could I have missed this one. Such a beauty. The sky and the reflections are super. Excellent POV and DOF. Hello Tim. Fantastic pic! The details and visual elements are all perfectly composed. Most definitely a picture I would have framed and mounted on a wall! TFS!!! Exceptionnal composition,especially with this sky.Very sharp with clear colors,well lit. It is really a beautiful place. C'est incroyable... on dirait m�me que c'est irr�el! Les couleurs et le calme qui ce d�gage de cette photo, merci de partager. Tr�s belle prise. Excellent shot and well done on the composition. Beautiful work. The w.s. did no justice for the image, it's just right as seen. If I were you, turn off workshop in your about you section. Youaah, it's very beautiful, congratulation. thanks for sharing this beautiful photo. I'm speechless, everything is georgous. hi tim, this truly is a magical place. Perfect lighting and exposure and excellent composition have made for a truly amazing landscape shot.